Lock in a great price for Cabañas & Apart Ruta 63 – rated 9.8 by recent guests! This cabin was exactly what we were looking for: in a small village with only 180 people, quiet, connected with nature and so much space for the kids to play and enjoy themselves. The town doesn't have a supermarket so bringing your own food is a must. There are a few restaurants and a brewery down the street. The viee of Lake Meliquina and the mountains was breathtaking! La amabilidad, y el estado exclente del añojamiento. Es de destacar el confort de los colchones y ropa de cama. la cabaña es nueva, al igual que toda su composicion (colchines, utencillos de cocina, etc) todo excelente, la vista es divina, meliquina el pueblo donde esta la cabaña tambien es muy pintoresco, excelente para quienes deseen descasar, los afitriones son muy amables, la vista muy buena. Estuvo excelente nuestra estadía en las cabañas, y el lugar es realmente bello. Recomendable! Excelente Cabaña. La vista de los ventanales es increíble. Agua caliente inmediata y colchones super cómodos. Excelente estadía. El lugar es bello bello!! 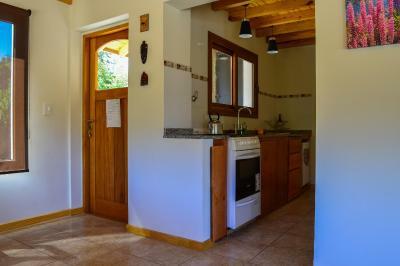 una salamandra hermosa..
Cabañas & Apart Ruta 63 This rating is a reflection of how the property compares to the industry standard when it comes to price, facilities and services available. It's based on a self-evaluation by the property. Use this rating to help choose your stay! 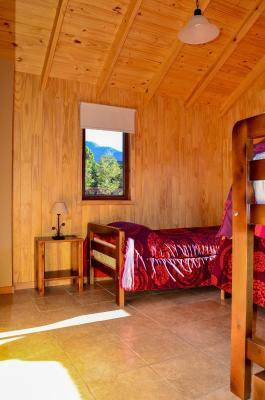 Cabañas & Apart Ruta 63 offers eco-friendly accommodations with rustic décor in Villa Meliquina. The property provides free WiFi access and features a fragrant garden. It has electric light around-the-clock. Featuring impressive views of the mountains and lake, each chalet is equipped with full kitchen facilities, a flat-screen TV, a seating area and a fireplace. All of them include wardrobes, wood heating system and complete bathrooms with free toiletries. 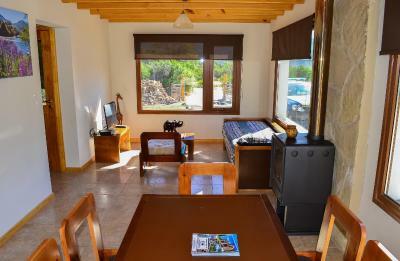 Each Chalet includes Barbecue facilities free of charge. A continental breakfast can be requested for a surcharge. A wide array of activities can be enjoyed at Cabañas & Apart Ruta 63, including skiing and fishing. The chalet offers free parking. It is 75 mi from San Carlos De Bariloche Airport. Electricity is available all day. This property is also rated for the best value in Lago Meliquina! Guests are getting more for their money when compared to other properties in this city. When would you like to stay at Cabañas & Apart Ruta 63? Featuring impressive views of the mountains and lake, this chalet is equipped with full kitchen facilities, a flat-screen TV, a seating area and a fireplace. It includes a wardrobe, heating and a complete bathroom with free toiletries. This chalet has a flat-screen TV, a complete kitchen and patio.It also features a living room. It has a man bathroom and an additional toilette. House Rules Cabañas & Apart Ruta 63 takes special requests – add in the next step! All children under 2 years are charged USD 7.87 per night in a crib. Cabañas &amp; Apart Ruta 63 accepts these cards and reserves the right to temporarily hold an amount prior to arrival. Cabañas & Apart Ruta 63 accepts these cards and reserves the right to temporarily hold an amount prior to arrival. Please note that the town does not have electric system nor cell phone reception. All electricity in Villa Meliquina is generated via sun panels or is wind-generated. Please inform Cabañas & Apart Ruta 63 of your expected arrival time in advance. You can use the Special Requests box when booking, or contact the property directly using the contact details in your confirmation.